It’s back to a more traditional oval circuit for Aric Almirola and the No. 10 Smithfield Ford Fusion team for Stewart-Haas Racing (SHR) this weekend at Chicagoland Speedway in Joliet, Illinois. Almirola’s first of two races last weekend on the road course at Sonoma (Calif.) Raceway was Saturday’s NASCAR K&N Pro Series West race, in which he finished second. Almirola took part in the Saturday race looking to gain more road-course experience for Sunday’s main event. The extra track time in the K&N race, along with a strong Ford Fusion and solid calls by crew chief John Klausmeier, led Almirola to an eighth-place result in the No. 10 Smithfield Ford Fusion in Sunday’s Monster Energy NASCAR Cup Series race. The finish marked the Tampa native’s strongest finish at a road course in his Cup Series career. It’s been since Memorial Day weekend at Charlotte (N.C.) Motor Speedway that the Cup Series has raced on a mile-and-a-half track, the configuration that dominates the 36-race schedule. Almirola finished 13th at Charlotte and looks for another competitive weekend at Chicagoland. In his first Cup Series start at the suburban Chicago track in September 2012, he earned the outside pole position. His best finish at the track is 10th, which he earned in September 2015. At 1.5-mile tracks this season, Almirola hasn’t finished outside of the top-13, with the exception of a 32nd-place finish at Texas Motor Speedway in Fort Worth due to an accident. For the past seven seasons, Chicagoland Speedway has kicked off the NASCAR playoffs. However, this year the venue’s race date was moved to July, when the track hosted Cup Series races from 2001 through 2010. In 16 Cup Series starts this year, Almirola has accrued an average start of 20.1, an average finish of 11.8, and he rounds out the SHR four-car contingent with the 10th spot in the point standings. Additionally, Almirola has had three Cup Series career-best finishes in a row – seventh at Pocono (Pa.) Raceway, 11th Michigan International Speedway in Brooklyn, and eighth at Sonoma. Almirola has four career Xfinity Series starts at Chicagoland, starting inside the top-10 each time, including one pole award in June 2011. The 34-year-old garnered two top-five finishes and two top-10s and led 10 laps in those four Xfinity Series starts. He also has two starts in the Camping World Truck Series at the track, both resulting in top-10 finishes. Almirola’s No. 10 Ford Fusion had a different look for May’s non-points-paying NASCAR All-Star Race. Waffle House appeared on the car to help kick off its first-ever “Who’s Your All-Star?” sweepstakes in conjunction with Smithfield Foods. Fans can enter the sweepstakes by snapping a photo with their favorite Waffle House associate and sharing via Twitter or Instagram using the hashtag #WhosYourAllStar. The top-10 associates and the customers who nominated them will receive special recognition and a Waffle House gift card. One grand-prize customer and associate winner will each receive a VIP experience to the NASCAR Cup Series season finale at Homestead-Miami Speedway in November. This weekend’s event at Chicagoland Speedway marks the 15th points-paying event during which the Smithfield livery has adorned Almirola’s No. 10 Ford Fusion. 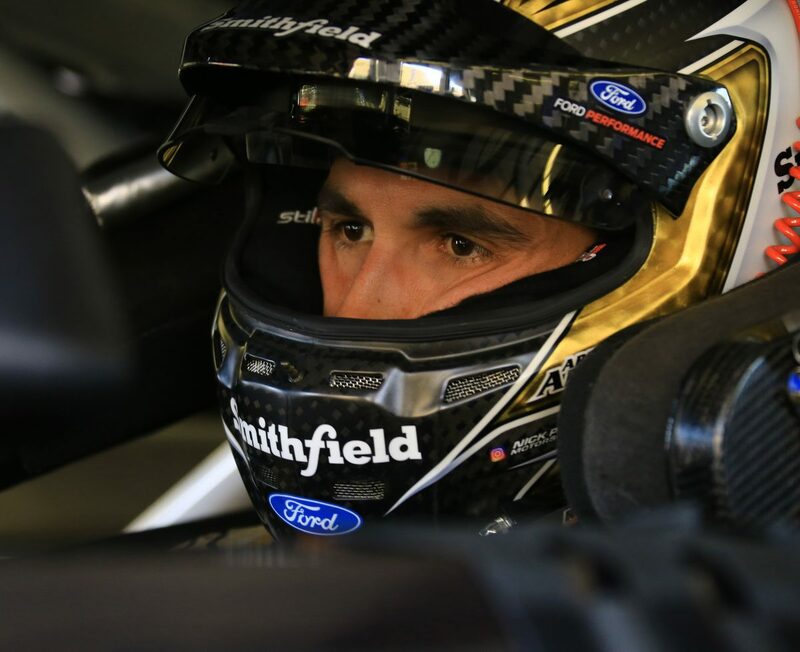 Smithfield, a brand of Smithfield Foods, which is based approximately five hours northeast of SHR headquarters in Smithfield, Virginia, is in its seventh season with Almirola and its first with SHR. Founded in 1936, Smithfield is a leading provider of high-quality pork products, with a vast product portfolio including smoked meats, hams, bacon, sausage, ribs, and a wide variety of fresh pork cuts. How do you feel about going to Chicagoland this weekend? Who inspired you to race?